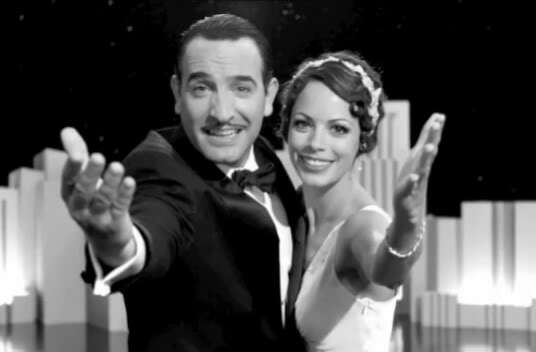 The Artist is now the Oscars favorite. Even the American Film Institute gave it an award and it's a European production. The Artist continues to be the film to beat, picking up awards from the New York Film Circle Online (NYFCO), Boston Society of Film Critics (BSFC), and a special award from the American Film Institute. But if critics don’t go with The Artist, they choose The Tree of Life, which was named best film by the Los Angeles Film Critics Association (LAFCA) and the San Francisco Film Critics Circle (SFFCC). The best picture race is turning into an East Coast-West Coast rivalry not unlike the Biggie-Tupac rivalry. I would pay good money to see film critics battle each other in the name of The Artist and The Tree of Life. Albert Brooks continues to dominate the best supporting actor category. If one thing is a sure bet at this point, it is Brooks’ nomination and that his biggest competition will be sentimental favorite, Christopher Plummer for Beginners. Jessica Chastain picked up a few wins for her many supporting roles this year as did Melissa McCarthy for Bridesmaids. The Best Actress category has become a three-way race between Meryl Streep, Michelle Williams and Tilda Swinton. Okay, it is really a two-way race between Streep and Williams. (The Oscar Gods will bend over backwards to give Streep her third Oscar.) But Swinton should be winning all the awards for We Need To Talk About Kevin. The best sign of things to come from this round of award winners is the rise of Bridesmaids. Can the comedy and Melissa McCarthy score Oscar nominations? I hope so. Also, one of my favorite 2011 films, Martha Marcy May Marlene is still being slightly shortchanged, winning the New Generation Award from the LAFCA and best new filmmaker award (for director Sean Durkin) from the BSFC. Unpopular opinion: I'm convinced that I will hate My Week With Marilyn because I am sick of the Marilyn Monroe craze. The round up of the critics awards winners is below. Share any of your thoughts on the awards season so far in the comments. I was beginning to think that I was the only one paying attention yet! I’m happy to see THE ARTIST getting so much early love, especially since I was skeptical what its chances would be in terms of growing beyond festival darling. I haven’t paid too much attention to the actors just yet – guess we’ll get more clarity on that tomorrow with the SAG’s, eh?